Twenty-five years ago, my grandma Adaliane and grandpa Don were vacationing in Hong Kong. While visiting Stanley Market, they picked up souvenirs. I’ve always adored the necklace they bought for me — a simple silver chain with an evil eye pendant. Now, I wear my necklace all the time. And every time I do, I think of my grandparents. Ada and Don were inseparable from the day they first met — in elementary school. When she was deathly ill in high school, he delivered her homework until she recovered. They rode motorcycles together. They married, raised three kids and ran thriving businesses. And, adventurers they were, they traveled. Treasured people pass along treasured jewelry. Along with my evil eye, I have pendants from three great-grandmothers I often miss. The pendant on the left is from my great-grandmother Lindy, who made delicious homemade donuts and was known to express her affection for you with a quick slap to the cheek. 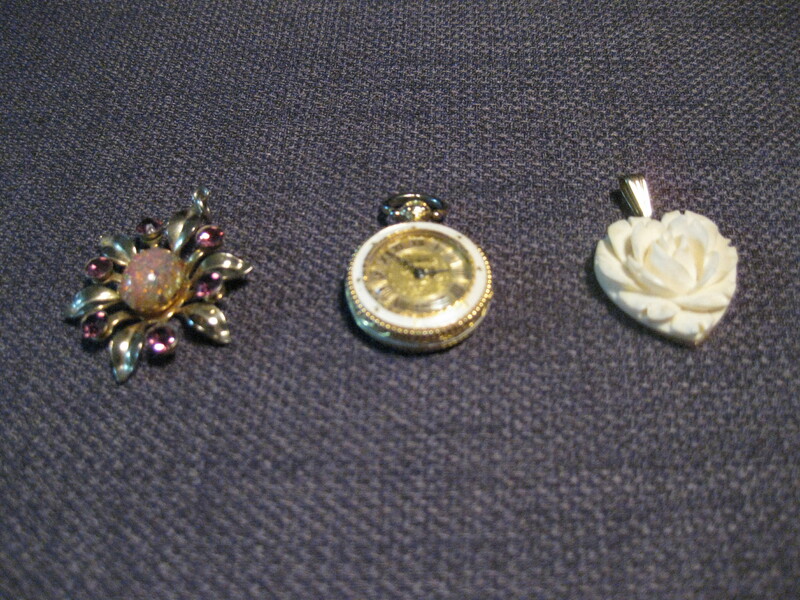 The middle pendant is from my great-grandmother Ruby, who was the first woman in her town to learn to drive and likely one of the last women of her time left standing – she died on her 99th birthday. The pendant on the right is from my great-grandmother Alma, who, upon every visit, offered smiles and — important to a chocolate-loving kid — macaroons. She was married to my great-grandfather, Wilfrid, for 71 years. Incredible. I read all Toque Girl posts and get excited every time I get a little *ping* notification on my blackberry that there is a new post. I then rush to my computer if it’s handy to read and enjoy with pictures in full glory. I often want to make comments, but this one was really touching and actually made me cry! Thanks Michelle for the glowing adoration of your grandparents and great grandparents. I feel so lucky to have the same kind of wonderful people and examples of marriage in my life. And I think it’s so important to honour them as you’ve done in this post! Ok, enough from me. Thanks for the great post and awesome blog! Wow. You always impress me Chica. 🙂 what a beautifully written post about some of my favorite people. Brought tears to my eyes. Sweetie! Thank you for the wonderful and inspiring post. I am a big believer in the Evil Eye I wear the one that my mother gave me every day, it makes me feel protected.